communicate successfully while traveling. For example, ASL signers must use different signs to ask about different places such as the bookstore, the hospital, the library, and the zoo. 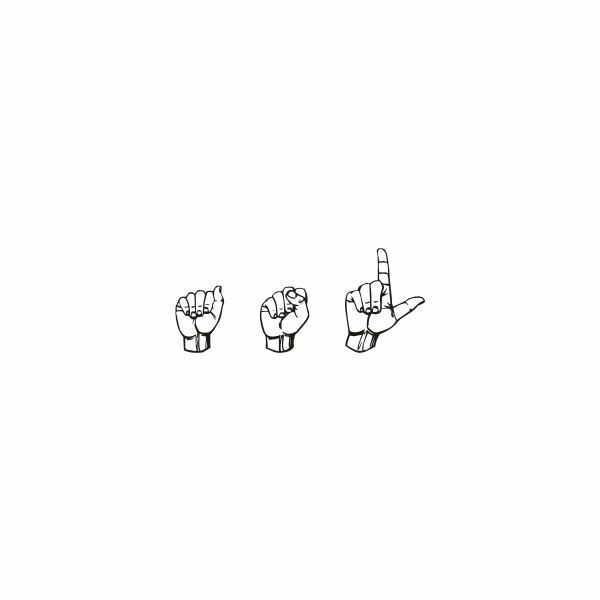 The following section provides textual descriptions of the motions used for various signs needed by ASL signers. apartment – Begin with the right hand in a fist with the thumb pointing up and held in front of the right shoulder. Then bend the wrist forward while opening and pointing the thumb and the index finger down. Then raise the wrist up again and place the thumb between the index and middle fingers of the fist. bookstore – Begin with the hands at chest level with palms together and the fingers pointing forward. Open the hands with a motion resembling the opening of a book. Then hold the hands in front of the armpits with the fingers straight and the thumbs resting on the palms of the fingers. Snap the hands forward at the wrists twice. bus stop – First finger spell the word B-U-S using the sign language alphabet. Then form the hands with the thumbs pointing up, the index fingers pointing forward, and the middle, ring, and pinky fingers pointed out towards and touching the opposite finger tips. Hold the hands in front of the body at chest level. Move the hands apart and then down and then together again while lowering the thumbs. church – Begin with the left hand at chest level with the palm facing the floor. Form the right hand into the shape of the letter C. Tap the thumb of the right hand onto the back of the left hand twice. city/town – Begin with both hands flat with the fingers together. Hold the hands in front of the nose with the tips of the fingers of the right hands touching the tips of the fingers of the left hand. Open the palms of the hands to form an upside down V. Then tap the tips of the fingers together three times. college – Begin with the left hand at chest level with the palm facing towards the body and the left thumb pointing up. Place the right palm facing toward the floor on top of the left palm. Then form two counterclockwise circles with the right hand while raising the right hand toward to chin level. corner – Begin with the left arm pointing forward at the elbow at waist level with the palm of the left hand facing toward the right and the left thumb pointing up. Hold the right hand in front of the body at waist level with the palm facing toward the body and the right thumb pointing up. Then tap the finger tips of the right hand on the finger tips of the left hand twice. The motion resembles a corner. dentist – Begin with the right hand in a fist with the right index finger in the shape of a hook. Open the lips of the mouth the reveal the teeth. Tap the right index finger against the teeth. Then hold the right and left hands at the right and left shoulders with the palms facing toward the opposite palm. Drop the hands from the shoulders down to the waist. freeway/highway – Begin with both hands forming the letter H of the sign language alphabet. Hold the hands at chest level with the right fingers pointing towards the body and the left fingers pointing away from the body. Pass the hands past each other twice by moving the right hand towards the body and the left hand away from the body. gym – Begin with the hands in fists with the index fingers held slightly above the height of the other fingers. Hold the right fist directly above the right shoulder and the left fist directly above the left shoulder. Twirl the fists in circles towards the back twice. hospital – Begin with the right hand forming the letter H of the sign language alphabet. Hold the right arm across the chest so that the index and middle fingers of the right hand rest on the upper left arm just below the shoulder. Then pull the right hand towards the front of the body so that the finger tips just come off the left shoulder. Then place the right fingers on top of the shoulder. Then pull the right hand down so that fingers again rest on the upper left arm. The motion forms a cross or plus sign. hotel – Begin with the left hand in a fist with the index finger pointing up in front of the center of the chest. Form the right hand into the letter H of the sign language alphabet and rest the right pinky finger on the top of the left index finger. The shape resembles a flag. Then curl the right index and middle fingers toward the body and then uncurl the fingers to resemble the waving of a flag. Repeat the motion. house – Begin with both hands flat with the fingers together. Hold the hands in front of the nose with the tips of the fingers of the right hands touching the tips of the fingers of the left hand. Open the palms of the hands to form an upside down V. Then move the hands apart and over the shoulders. Then drop the hands down to the waist. intersection – Begin with both hands in fists with the index fingers straight. Hold the hands at waist level with the palms facing the floor. The right index finger points at an angle toward the front left and the left index finger points at an angle toward the front right. Then move the hands toward the center of the body and place the right index finger on top of the left index finger to form an intersection of the fingers. library – Begin with the right hand at chest level. Form the right hand into an L with the index finger pointing up, the thumb facing left, and the other three fingers curled down onto the palm. Circle the L in a clockwise circle. market/store – Begin by holding the hands in front of the armpits with the fingers straight and the thumbs resting on the palms of the fingers. Snap the hands forward at the wrists twice. restaurant – Begin by forming the right hand with the index and middle fingers straight, the middle finger crossed over the index finger, the ring and pinky fingers on the palm, and the thumb on the ring and pinky fingers. Place the right index and middle fingers on the right side of the mouth. Then move the right fingers down the face to the chin. Move the right hand to the left side of the mouth. The move the right fingers down the face to chin. playground – Begin by forming both hands with the index and middle fingers folded down towards the palms and the thumb, ring, and pinky fingers straight and stretched apart. Hold both hands in front of the body at armpit level. Swing the hands out and then in and then out. Then form the hands with the thumbs pointing up, the index fingers pointing forward, and the middle, ring, and pinky fingers pointed out towards and touching the opposite finger tips. Hold the hands in front of the body at chest level. Move the hands apart and then down and then together again while lowering the thumbs. school – Begin with the left hand at chest level with the palm facing up. Tap the palm of the right hand on the palm of the left hand twice. street – Begin with the hands on either side of the body at waist level with the fingers closed, the palms facing the opposite hand, and the thumbs pointing straight up. Then move both hands forward to the left. zoo – First use the index finger of the right hand to draw the letter Z in the air in front of the face. Then point all four fingers and the thumb of the right hand forward and move the right hand to the right. The accompanying printable vocabulary sheet is available for download at Around Town ASL Vocabulary Sheet.